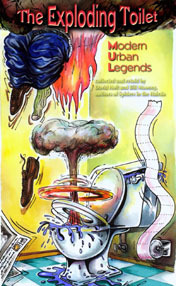 Bill Mooney and I have collected some of our favorite urban legends in the recording and book Spiders In The Hairdo: Modern Urban Legends. They’re usually just anecdotes or short stories told in conversation — rarely full-blown tales. The simple, yet bizarre plot twists of urban legends are wonderful material for the modern storyteller. Hey, did you hear the one about the man who dropped a lit cigarette into the toilet with some gasoline-soaked rags? Of course you did. It happened to your gym teacher’s cousin. 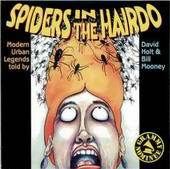 Or was it your cousin’s gym teacher?Storytellers David Holt and Bill Mooney follow-up their previous hit, Spiders in the Hairdo, with a whole new collection of modern urban legends. Have you ever heard stories like these? They are contemporary urban legends, our modern-day folktales. You often hear them in conversation, or read them in newspapers, or sometimes hear them reported on newscasts as true. Occasionally, they turn up as plots for TV shows. These modern urban legends can be found all over the world in many variations. The settings and characters change with each telling to reflect the attitudes and societies of both teller and listener. Oddly enough, they are never told by the person they happen to. Invariably, these stories happen to a Friend of a Friend (my aunts neighbor, my boss’ daughter,etc.). For that reason, they are also called Foaftales–F.O.A.F.–because they happen to a Friend Of A Friend. The person telling these tales honestly believes they are true and that the “true” facts can be found just a few informants back. There is just enough credibility in each story to be believable. We don’t often think of a legend or a folktale as something urban or contemporary. But legends are a big part of our modern day folklore. Unlike older, more fanciful folktales modern urban legends involve recent events or situations that seem real. They are usually full of irony and often have a supernatural element. Modern urban legends reflect our concerns, fears, prejudices, and our delight in other people’s folly. Some we’ve kept anecdotal; others we have expanded into full stories. By filling out the characters and setting of the original anecdote or by combining several elements (as we have in “The Slasher”), we have tried to bring the stories to life. Some of them are really gruesome, even downright gross. But remember, we didn’t make up the plots of these tales. You did. Or, at least, other people like you. Nobody knows where they come from. Some like “The Vanishing Hitchhiker” have been around for centuries and keep being up-dated. They are ever changing and continue to reflect some part of who we are. Keep your ears open for new urban legends. They are being born every day. Below are some Urban Legends for you to enjoy. In 1960, Dolores had just graduated from high school and was living on her own for the first time. She didn’t have much money, but she made sure she budgeted enough to have her hair done professionally once every three months. She told Andre, the hairdresser down the street, that she wanted the latest style. Andre ratted and teased until her long black hair stood up in a beehive shape on top of her head. Dolores knew she couldn’t afford to have the beehive redone very often, so she followed Andre’s instructions carefully. She sprayed her hair every morning. Each night, she wrapped it in toilet paper and slept on her back so that she wouldn’t mess it up. After several weeks of spraying and wrapping, her hair became like a helmet. One morning, she awoke with a terrible pain in her arm. She looked down and saw a swelling with a angry red spot in the center of it. It terrified her and she raced to the doctor. “You’ve been bitten by a black widow spider,” he said. The doctor treated the bite. Three days later, she returned to the doctor’s office with bites on both arms.The doctor immediately put her in the hospital. When Dolores finally got well, she searched through her apartment. Spider webs were in every corner. She called in an exterminator who fumigated the place. That night, she felt safe and secure for the first time. When Dolores awoke the next morning, the first thing that met her eyes were spider webs in all corners of the room. How can this be? she thought. She called the exterminator and told him the spiders were back and their webs were all through the house. The exterminator agreed to return on Wednesday. Tuesday morning, Dolores was awakened by a tickling sensation on her cheek. She opened her eyes and looked up. Spider webs stretched from her face to the bedstead, the lamp, and the pillows. In each web, she could see a black widow spider. As a shudder ran through her body, the spider webs began to shake and the spiders scrambled toward her face. She screamed and jumped out of bed. She looked back at her pillow, expecting to see the spiders. But there were none. “Where did they go? Are they in my hair?” Dolores ran to the bathroom and started unwrapping the toilet paper from around her head. Then she realized she was going to need help. I can’t do this alone, she thought. She quickly threw on her clothes and ran down the street to Andre’s. “I can’t,” he said. “I’m sorry, but I’ve got a shop full of customers.” Dolores pulled a woman out of the salon chair and sat down. As Andre began to unwrap the toilet paper, black widow spiders spilled out of Dolores’s hair, down her shoulders, and onto his arms. Both of them began to scream. Hundreds of black widow spiders dropped to the floor and began crawling around the shop. Andre’s customers screamed in horror. The shop echoed with the hysteria of Andre and the women racing to the door, black widows climbing up their legs. Once everyone had pushed through the door, they looked back. Dolores was still inside. They watched in disbelief as she grabbed a pair of electric clippers and began cutting off her hairdo right next to the scalp. They watched as the beehive fell to the floor and burst open. Inside were millions of spider eggs, ready to hatch. It was finals time at the university. A student had partied late the night before a psychology final. He was afraid he would not do well on the test. As he walked into class, he saw the two blue books the professor always provided for the final, to make sure no one could cheat. He had no idea how to answer some of the exam questions, so he devised a plan. He began to write a letter to his mother in the first blue book. He told her how he had finished the exam early and had some extra time, that things were going well at the university and how much he liked his psychology professor. He went on to explain that he felt he had done very well on the test and was just killing time until the period was over. At the end of class, he handed in the blue book that contained the letter to his mother. He then ran to the library, looked up the answers to all the questions and wrote them in the second blue book. He sealed it in an envelope and mailed it to his mother. When the grades were posted, the student had aced the class with an A. The first thing every morning, a man showed up at the local news stand and bought all the papers. He would thumb through the paper until he got to classified ads. He wanted to make sure he was the first to see any good deals on used cars. He couldn’t believe his eyes when he saw an ad for a low-milage Corvette priced at a hundred dollars. He figured it must be a mistake, but he was determined to check it out.